Nuell Air Equipment was founded by Jim Nuell in 1968. Jim Nuell worked with and was trained by Dr. Hall of Hall Surgical fame. Dr. Hall is generally considered to be the inventor of pneumatically powered surgical equipment. Dave and Darlene Holsclaw were the first and only employees of Nuell Air Equipment and were trained by Jim Nuell. The Holsclaws purchased Nuell Air Equipment in 1978. Darlene Holsclaw is now President and CEO of Nuell, Inc. making our company woman owned. Dave Holsclaw is Executive Vice President. 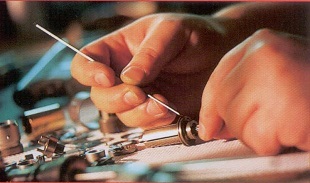 In 1992 Nuell, Inc. added an in house machine shop to help aid in the production of hard to find replacement parts, as well as obsolete parts. Since this addition Nuell, Inc. has increased the size of its machining operation to include a Manufacturing Division. Our corporate goal at Nuell, Inc. is to provide our customers with superior repairs at a competitive price. We will strive to provide our customers with an excellent turn around time while keeping patient safety up-most in our minds. Oldest third party powered equipment repair facility. Over 24 highly trained repair technicians.